Anti-Reverse/Direct-Drive: A reel comes configured originally as either AR or DD. The only difference between the two designs is a different drive plate and a different drag capsule. The Anti-Reverse model has a handle which drives the spool through the drag system. The Direct-Drive model has a handle attached to the drive plate which drives the spool through a keyed positive lock. To change between the two modes, you simply swap out the drive plate and drag capsule/handle. The two swapped pieces are an option, referred to as a Conversion Kit. They are sold separately. To help your understanding, see the Conversion Kits page. Left/Right-hand Retrieve: The spools for the InterCoastal Series are symmetrical. They are identical on each side and have no specified inboard/outboard side. This is truly revolutionary for a fly-fishing reel design. Because of this, there is no clockwise/counter clockwise wind for the line. It doesn't matter. With this design, you are able to switch the retrieve in a simple 4 step process: (1) Remove the spool, (2) switch the pawl lever to allow the bridge to rotate in the opposite direction, (3) turn the spool around, (4) turn the reel around on the rod. It is done in less than 15 seconds. You do not need to re-spool your line. Standard Arbor/Large Arbor: Reel bodies hold either the standard conventional arbor spool or a large arbor spool. The outer diameters of the spools are the same, making them modular to the reel body. It becomes your choice as to whether to put on the standard arbor or large arbor. However, because the line capacity is reduced while the outer dimension stays the same, the large arbor spool makes the reel into a smaller sized reel. For instance, the 12wt body with the standard arbor spool is a 12wt reel. 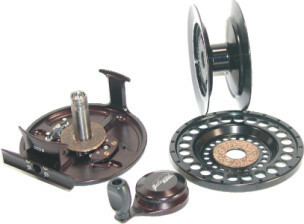 The same 12wt reel body with the large arbor spool becomes a 10wt (large arbor) reel. Same body, two different size spools. The simple spool design allows you to carry multiple spools with varying tapers, sizes, and backings to meet any condition you encounter. All InterCoastal Series Gilmore Reel spools are precision machined from solid bar-stock 6061-T6 aluminum and have a MSRP of only $99. No Tools Required: These reels were designed to be configured without the use of ANY tools. Any of the above configurations can be done in seconds. You have many more things to worry about on your boat than finding the correct tool and worrying about losing tiny pieces. Reversing the retrieve requires only a coin to switch the pawl lever and change the direction of rotation on the bridge arbor. Performance Drag System: We designed the reel with a dual disc drag system. This is very rare. Analogous to a caliper brake system, the dual disc drag system doubles the drag surface area and balances the clutching action on both sides of the spool. Drag surface areas are made up of a cork composite material against a self lubricating graphite/Teflon surface. The two 1/16th inch thick cork composite surfaces provide a full 1/8th inch of compression. These dual drag surfaces provide extremely low startup inertia and an extremely strong drag. The self-lubrication provided by the graphite side allows this reel to spin at extremely high RPMs for extended periods under intense drag pressure. The drag system has undergone intensive factory testing on a vertical milling machine under a full 10 lb drag setting. After 24 hours and over 180,000 revolutions, we turned the machine off and gave the drag system a passing grade. The drag simply turned black with graphite. The 10 lb resistance remained. Field testing and customer feedback shows us that the reel has performed admirably and reliably against the largest of sailfish, tarpon, and tuna. Saltwater Design: Gilmore Reel's InterCoastal Series is machined from solid bar stock 6061-T6 marine-grade aluminum. The hard-coat type III anodize used on our reels is .002" thick, which is much better than the .0001" found in the type I anodize. We can only put a hard coat anodize on a dark color such as black or dark blue. This is why we don't offer the reel in a light color. Other components on the reel are made from titanium and marine grade 316 stainless steel. These reels were specifically designed to resist corrosion and provide years of use in a harsh marine environment. Quiet Retrieve Setting: The InterCoastal Series clicker can be silenced for quiet operation. When the clicker is disabled, the only sound is a very quiet click created by the pawl ratchet assembly over the bridge arbor gear teeth on the retrieve. The reel is completely silent when spooling out. Precision Balanced: The design of the InterCoastal Series included precision balancing on a Schenk balancer. The method used is exactly the same as that used for other products produced by VPE, Incorporated, which require absolute precision balance at rotational speeds in excess of 3500 RPMs. This method enabled the design team to engineer the exact location and weight of the counterbalance on the direct-drive model's drive plate. Additionally, transverse balancing can be noticed by the offset reel foot. Made in the USA: Gilmore Reels are manufactured in the United States of America. 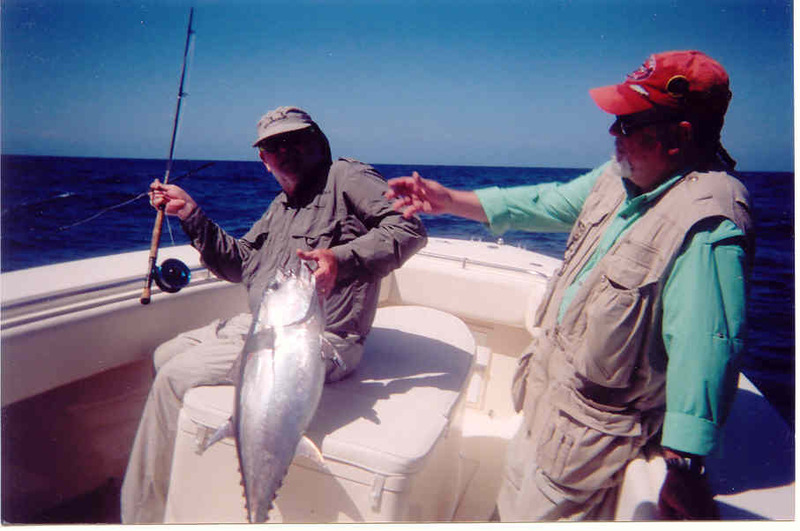 Fly fishing reels are a separate product line and division of VPE, Incorporated. VPE, Inc. specializes in machine fabrication of industrial products in a variety of fields including medical, aerospace, and robotics.